With jockey James McDonald reporting that the run of Voleuse de Coeurs (tenth beaten less than eight lengths) in the Melbourne Cup was an encouraging one for the long term, Ballymore Stables is looking forward to a fresh attack on the big race this time next year! Meanwhile we have another Melbourne Spring feature race day to enjoy- taking three nice horses to the Oaks meeting at Flemington on Thursday. We kick off with Murcielaga (pictured) in the second event, the Swisse Wellness Trophy over 1800m – and we are hopeful that he can continue on his winning way having been successful at his last couple in impressive fashion. A horse who has always shown ability, the four-year-old has improved his racing manners since being gelded and has looked good saluting at Ballarat and Sale in recent weeks. Whilst he has drawn out in barrier 13, the son of Testa Rossa does have the services of outstanding jockey Kerrin McEvoy. Faring better in the barrier draw was Octavia who jumps from gate 5 in the fourth race, the G.H Mumm Stakes. Out of the placings (rare for her!) at her most recent outing at Caulfield, Octavia drew wide that day and, after missing the start, had to do plenty of work on pace. 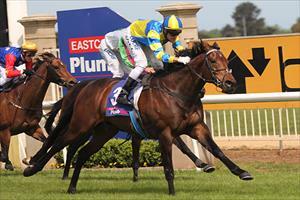 She was far from disgraced however and on her previous consistent form looks hard to toss in the Group 3 1100m event. “She looks terrific,” Moroney enthused – “we can’t fault her." Spectral Black is the final of our three Oaks Day runners, taking his place in the final event, the VRC Vase. To be ridden by Darren Gauci, the five-year-old strips fitter for two recent runs and will be suited both up in distance and on firmer ground.